Central America 1. Including Yucatan, Belize, Guatemala, Salvador, Honduras, Nicaragua and the Southern States of Mexico. This is a scarce 1842 example of the Society for the Diffusion of Useful Knowledge or S.D.U.K. 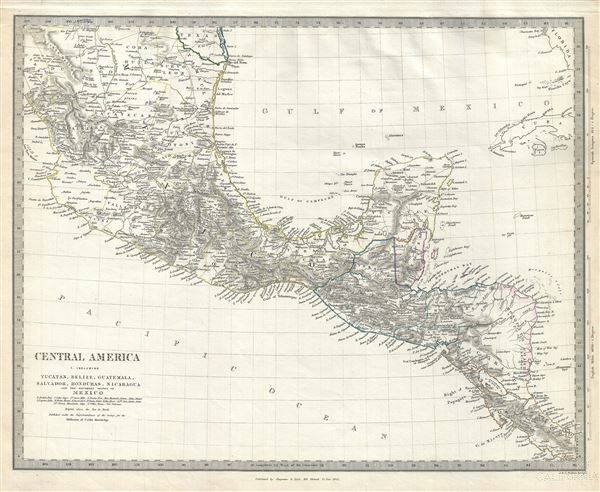 map of Central America, including southern Mexico, Guatemala, Belize, Yucatan, Honduras, El Salvador, Nicaragua and Costa Rica. The southern portion of the nascent Republic of Texas is shown here in its final year as an independent republic before being annexed into the United States. Offers extraordinary detail, noting towns, rivers, lakes, and topography. The map also marks the Mosquito Cays and the Mosquito Coast, which is a corruption of the Moskito, its indigenous tribal inhabitants. Rumsey 0890.144. Phillips (Atlases) 794.